Unwrap the gift of dreams for a vulnerable child with the gift catalog. 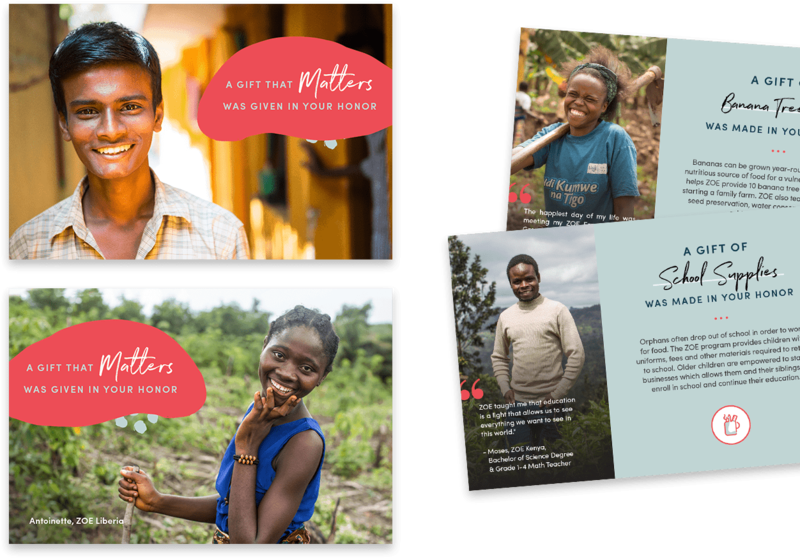 Filled with meaningful gifts for your friends and family, the gift catalog lets vulnerable children around the world know that someone believes in their ability to make their dreams come true. Give what matters to those who matter. For every gift we provide the ability to send a card for the person or group that has inspired your donation. Select an electronic card or request a mailed card to give to someone you love. *Orders must be received by December 12th to guarantee a Christmas delivery. Because rabbits can have up to six litters a year, they are a good source of income for a vulnerable child who is working towards self-reliance and sustainability. Children can then pay for many of their basic needs, such as school materials, food, clothing and medical care. Bananas are very nutritious and can be grown year-round in the countries where ZOE orphans live. The ZOE program teaches children about seed preservation, water conservation and ways to cultivate farms both large and small for optimal harvests. Many children in the ZOE program choose to grow maize because it is an essential part of their traditional diet. 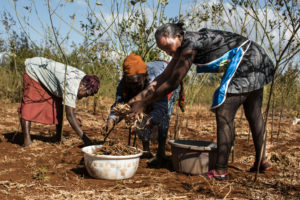 In many of the villages where ZOE children live, a maize-meal is a culinary staple, as well as a great source of food and revenue. Chickens are raised by many in the ZOE program because they are easy to keep and inexpensive to feed. A hen can lay up to 200 eggs a year, which is plenty for children to eat and sell in a village or local market. Orphans can also generate income by raising and selling chicks. Orphans often drop out of school in order to work for food. The ZOE program provides children with uniforms, fees and other materials required to return to school. Older children are empowered to start businesses which allows them and their siblings to enroll in school and continue their education. A cooking pot can be the difference between sickness and health for a child living in poverty. When children cannot boil drinking water and properly cook their food, they can suffer from chronic health problems. ZOE ensures children receive vital resources and training to be healthy and prevent illness. Goats are easy to care for, thrive on otherwise unproductive land and improve food security. One goat can produce up to a gallon of milk per day. Raising and selling goats can be a good source of income. The children are trained how to care for goats before they receive them. Cell phones are an essential part of daily life where ZOE works. Repairing and charging cell phones and other devices is a lucrative trade for an orphan. Some participants in the program have invested in solar-powered televisions and screens to run small movie theaters. 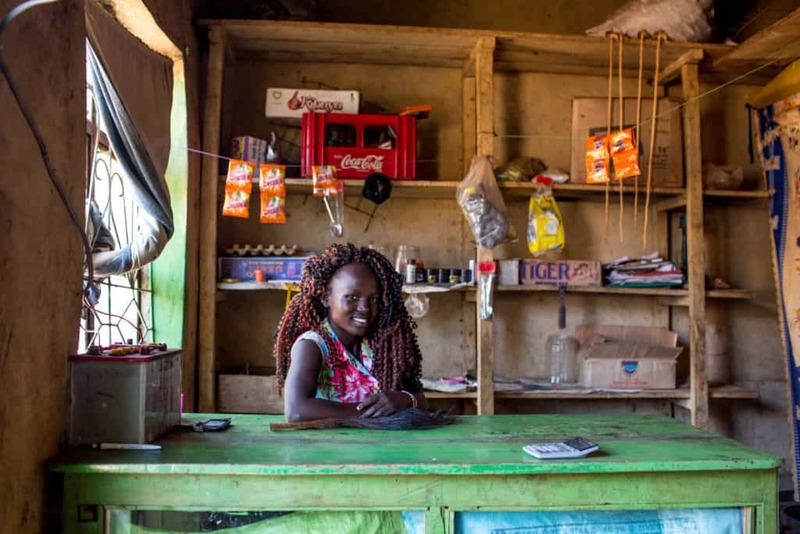 A common vocation for orphans in Kenya and Liberia is that of a hairdresser. Older orphans learn this trade and how to manage such businesses. Aspiring stylists are provided with sinks, hair dryers, combs and other necessities for their businesses to thrive. 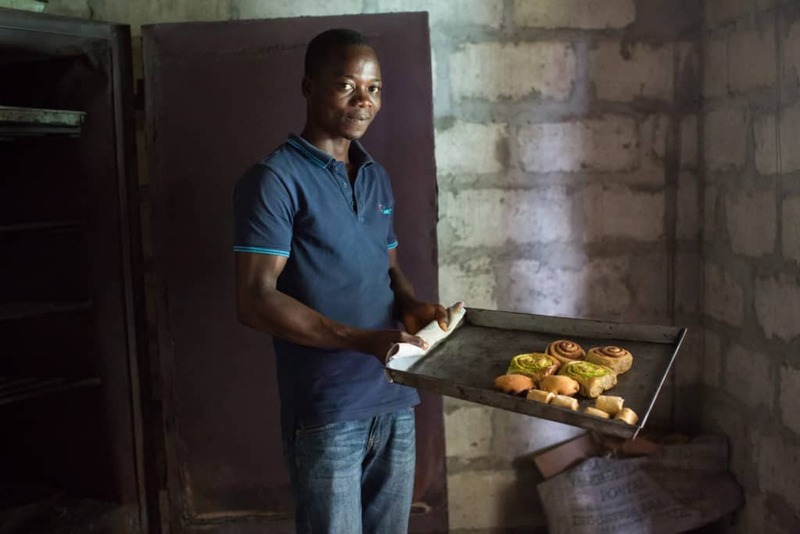 Having the right tools is essential for an orphan who wants to start a new business. For aspiring carpenters, ZOE provides vocational training as well as the hammers, saws, clamps, work gloves and other tools necessary to repair homes and build furniture. For an orphan living in a rural village, an ox plow can be a game-changer. An ox plow enables an orphan to work large tracts of land providing abundant harvests to eat and sell. Some of the children in the program will rent their plows to nearby farmers for extra income. can generate income quickly and address immediate challenges such as hunger and lack of housing. sold at a profit in their communities. Spiritual growth is at the heart of ZOE’s program. Bibles are provided to groups of orphans when they graduate. Throughout the program, children learn about God’s love in meaningful ways. ZOE connects children to local churches so they can continue to grow in their faith. Many schools in the areas where ZOE works require that children wear uniforms in order to attend. When ZOE orphans become tailors, they can provide their fellow working group members with access to affordable, high-quality uniforms so they can return to school. Many ZOE children live in very rural areas where infrastructure and sanitation resources are limited. Ensuring children have a safe, sanitary, enclosed latrine is an essential part of ZOE’s health and disease prevention efforts. Enclosed toilets also help keep children, especially young girls, safe from abuse. A cow can make a big difference for the vulnerable children ZOE serves. ZOE provides the first cow to a working group of children. The children choose which family in their group will care for the cow until it calves. That family then keeps the calf and passes on the cow. During ZOE’s program, up to three calves can be born — enabling as many as four families to each have a cow of their own. 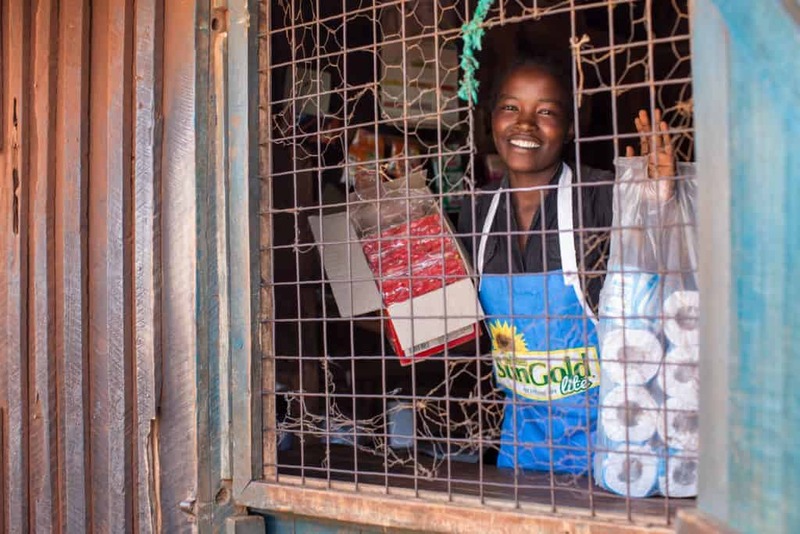 Orphans become entrepreneurs who start multiple businesses that grow and thrive. Groups of ZOE orphans learn business and financial management skills together and share their challenges and successes with one another to improve their outcomes. This gift helps ZOE provide business funding to ten orphans. What large-scale impact can do. Impact 60-100 orphans with a full partnership. Whether you choose to personally fund or to fundraise, you can pick the country. You determine your own payment plan when you make your pledge commitment of $8,000 per year for 3 years. Make a pledge commitment for half the cost of a full partnership and impact 30-50 orphans. Whether you choose a payment plan or to fundraise, you pick one of the 7 countries where ZOE works. $4,000 per year for 3 years will move a group of children beyond charity. It only takes $8/month to empower one orphan. Make a decision to do your share and choose the number of children you want to impact. We promise to report back to you about the group of children you are supporting so you can see the difference you are making. Give dreams all year long. It only takes $8 a month to empower one orphan. Choose the number of children you want to invest in, set up your monthly gift, and watch for reports about the group of children you are directly supporting. We promise to honor your generosity and use your donation in the most effective way possible. The Gift Catalog prices above represent the equivalent cost to ZOE based on periodic surveys of the countries we serve. Each item purchased is representative of a contribution toward the entire mission of ZOE. Donations will be used to provide assistance where needed most to empower the most vulnerable children in need.